(Rick Bowmer | The Associated Press) Fred Malek gestures during an interview with the Associated Press in his Washington office Thursday, May 16, 2002. Fred Malek, a Washington-area business executive who led Marriott Hotels and Northwest Airlines, raised millions for the Republican Party and advised four presidents during a career that was shadowed by his role in President Richard Nixon's crusade against a "Jewish cabal" in the government, died Sunday. He was 82. Fred Malek, a Washington-area business executive who led Marriott Hotels and Northwest Airlines, raised millions for the Republican Party and advised four presidents during a career that was shadowed by his role in President Richard Nixon's crusade against a "Jewish cabal" in the government, died Sunday. He was 82. His death was announced by the American Action Network, a conservative advocacy group he formed with former Sen. Norm Coleman, R-Minn. The organization did not provide details, but Malek's friend Pete Snyder, an entrepreneur and Virginia Republican, confirmed that he died Sunday, citing the family. The son of a beer-delivery-truck driver, Malek was a Green Beret, a Harvard University business school graduate and a millionaire before he turned 30. He went on to cultivate a reputation as a management expert and leveraged his business success into a four-decade stint as a GOP power broker and a cable talk-show regular. But he was hounded by his involvement in Nixon's effort to reassign Jewish officials at the Bureau of Labor Statistics, for which he long apologized, insisting he was not an anti-Semite. Malek was working as White House personnel chief when, in 1971, Nixon became angered by a news report in which the bureau attributed a drop in the unemployment rate to a statistical fluke. "See, the Jews are all through the government, and we have got to get in those areas," Nixon told H.R. "Bob" Haldeman, his chief of staff. "We've got to get a man in charge who is not Jewish to control the Jewish." Malek was tapped to determine how many Jewish officials were in the bureau. In a memo, he provided a count of 25 Democrats at the agency and 13 employees — later revised to 19 — who "fit the other demographic criterion that was discussed," an oblique reference to Judaism. A 1988 report in The Washington Post suggested that Malek's count resulted in the transfer of two senior BLS officials who were Jewish and "ousted from their posts and moved to less visible positions." Malek said he had nothing to do with the officials' demotions, saying, "I would have found it offensive and morally unacceptable, and I would have refused." He called Nixon's fear of a treacherous "Jewish cabal" "ridiculous" and "nonsense," and he said he refused four times to make the count before he finally gave in at the insistence of the president. Nevertheless, he resigned from his position as the Republican Party's deputy chairman. In 2007, Slate writer Timothy Noah first reported on a White House memo at the center of the incident, in which Malek described "the planned transfer of three Jews to less-visible jobs and the effective demotion of a BLS deputy with a Jewish-sounding surname." The incident had little effect on Malek's business fortunes. He led Marriott from 1981 to 1988, a period in which he noted that profits quintupled and the company's stock increased eightfold, then served as president and chairman of Northwest Airlines after helping to engineer a leveraged buyout in 1989. That same year, he was part of a team that acquired Coldwell Banker from Sears. He served as co-chairman of the real estate firm in the 1990s (it is now known as CBRE Group) and assisted in the buyouts of the Ritz-Carlton hotel chain and the Texas Rangers baseball team, which he acquired in 1989 with partners, including George W. Bush before he became the 43rd president. Malek later spearheaded a bid to acquire the Washington Nationals from Major League Baseball, which had purchased the Montreal Expos in 2002 and moved the franchise to the District of Columbia. Malek's investment group was edged out in 2006 by a rival team led by real estate developer Ted Lerner. Malek's bid was reportedly hindered by a 2006 Post article by columnist Colbert I. King, who chronicled a 1959 incident in which Mr. Malek, then 22, was present when a dog was "killed, skinned, gutted and barbecued on a spit" during a night of heavy drinking in rural Illinois. Malek, who was briefly held in jail as part of the incident, said "that he was not a participant and that he was in no position to stop it," King reported. Malek also made headlines in 2004, when he and his firm Thayer Capital Partners were fined by the Securities and Exchange Commission, which said the Connecticut state treasurer used investments in the company to reward a political supporter. He had by then firmly established himself as a force in Republican politics, having served in the administrations of presidents Nixon, Gerald Ford, Ronald Reagan and George H.W. Bush, and worked on the campaigns of almost every GOP presidential candidate of the past 40 years. The sole exception, President Donald Trump, nonetheless appointed Malek chairman of the Woodrow Wilson International Center for Scholars, a congressionally chartered think tank. Malek's fundraising abilities were perhaps most evident at the American Action Network and its sister group, the Congressional Leadership Fund. In December, the groups announced that together they had raised more than $213 million in the 2018 election cycle. In a statement, David Rexrode, the association's executive director, said Malek helped elect 84 Republican governors while serving as finance chairman and raised $312 million through the Executive Roundtable in the past 10 years. Frederic Vincent Malek was born in the Chicago suburb of Berwyn, Illinois, on Dec. 22, 1936. His grandparents were immigrants from Czechoslovakia and Yugoslavia, according to a Richard Nixon Presidential Library and Museum biography. Malek received a bachelor's degree from the U.S. Military Academy in West Point, New York, in 1959. He served in Vietnam in 1961 and later led West Point's board of visitors. He received an MBA from Harvard University in 1964 and after working in business joined the Nixon administration in 1969 as deputy undersecretary of the Department of Health, Education and Welfare, where he became known as "the hatchet." 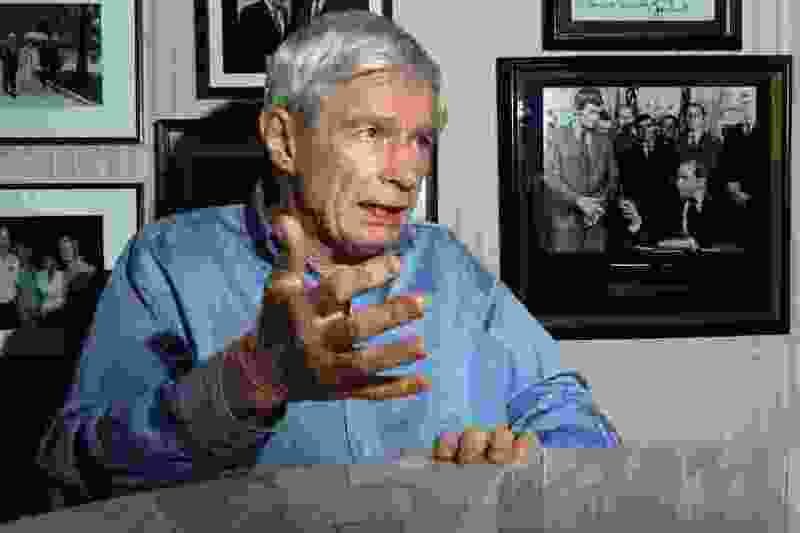 He went on to serve as special assistant to the president and as deputy director of Nixon's Committee for the Re-Election of the President, during which he headed a "responsiveness program" in which federal grants were used to punish Nixon's enemies. Malek, who was not implicated in criminal wrongdoing during the Watergate investigation, later served as deputy director of the U.S. Office of Management and Budget under Nixon and Ford before returning to the corporate world as a vice president at Marriott. He directed the 1988 Republican National Convention and in 1992 managed George H.W. Bush's unsuccessful re-election campaign. Survivors include his wife of 57 years, the former Marlene McArthur of McLean, Virginia; two children, Michelle DuPont Olson of McLean and Frederic W. Malek of Bethesda, Maryland; and five grandchildren. Malek was a donor and board member of the America-Israel Friendship League, and drew support from Jewish community leaders such as Abraham H. Foxman, national director emeritus of the Anti-Defamation League. The organization honored Malek with an achievement award in 2014.